Our friends Daniel and Tracy are restaurateurs, the founders of both Nibblers and Origen. 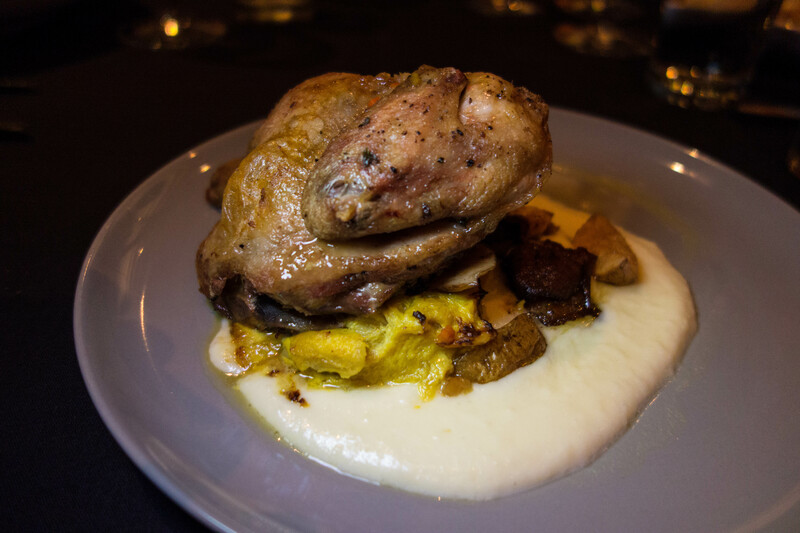 Recently, they were telling us about an innovative new place in Nashville called Catbird Seat. We decided we had to take them and go see for ourselves. What is it about Tennessee? You’d think there isn’t much here for a California boy, but I come here every April for the Gatlinburg Regional, we were here in March for the NABC and now we’re back to go out to dinner. One of the strange coincidences of life, I guess. In any event, we left the house in the dark of the morning yesterday, cooled our heels in LAX for 3 hours and got here in the late afternoon. We had reservation at the Hampton Inn, but there was huge construction going on all around the hotel which they conveniently forgot to mention when booking. We refused to stay, are still having to fight Expedia even though everyone promises a money back guarantee, and ended up downtown at the DoubleTree in a better hotel for less money, free internet and a complimentary shuttle all over the downtown area that save a fortune on taxis. We let Tracy, the wizard of both the kitchen and the internet, search for a great place for dinner, and we ended up at Flyte World Dining and Wine. She done good; dinner was fantastic. Flyte is in a very large building, and they had almost no customers. I hope that’s because it was Wednesday and the World Series was on, because this place deserves to thrive. A tasting menu was offered, with 3, 6 or 9 courses, but we chose to order a la carte. Dining with serious foodies means that everyone tastes all the dishes, nothing is sacred. The first thing I saw on the menu was Elk Tartare, so you know that was coming my way. 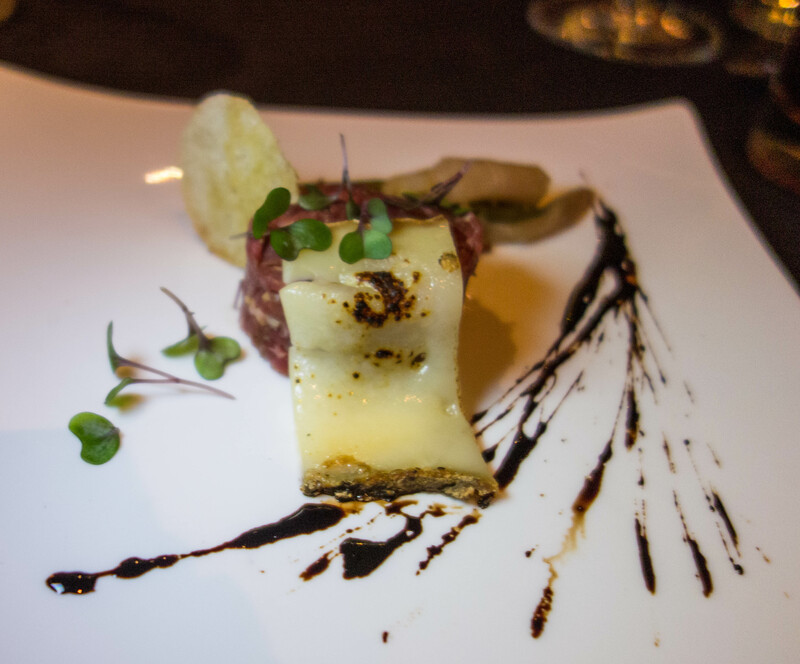 The Elk was very good–flavorful, chopped just enough and no more, a more complex flavor than beef. What was more interesting was the cheese, a cave-aged Tennessee Tombe–fantastic, deep, rich and involving. A great choice. Other first courses included a beet salad with a wonderful walnut puree, a watermelon gazpacho with blue crab which seemed more like excellent crab in watermelon juice, and the hit of the course, a Chanatrelle soup with chestnut bread pudding so rich and smooth and creamy we were fighting over the chance to scrape the bowl. I’m the last guy in the world to rave about a mushroom soup, but this was extraordinary. Tracy’s Game hen was pretty spectacular, too. It was cooked sous vide, a technique wherein the food is sealed in a bag and immersed in not-quite boiling water, which cooks very gently yet thoroughly. The equipment is far too expensive for home cooks and the process can take quite a while, but the results are wonderful–the inside is cooked the same as the outside, everything done to perfection. I had a breast of duck, served over risotto with chestnuts and Japanese sweet potato, and could find no complaint. Gail enjoyed the short ribs, served over corn pappardelle, something I’ve never seen–wide flat sheets of pasta made from corn. Daniel had a vegetable dish with farro and oyster mushrooms which the chef had foraged himself–if it satisfies him, it has to be great, and he was indeed satisfied. It was a slow night, and we’re pretty interesting customers, so the chef came out of the kitchen to meet us. He looks like he’s about 14, but he’s the boss. Chef Matt Lackey went to the CIA–Culinary Institute of America which is in New York and every weekend he would go to NYC and stage (work for free) at Thomas Keller’s Per Se, on of the world’s great restaurants. 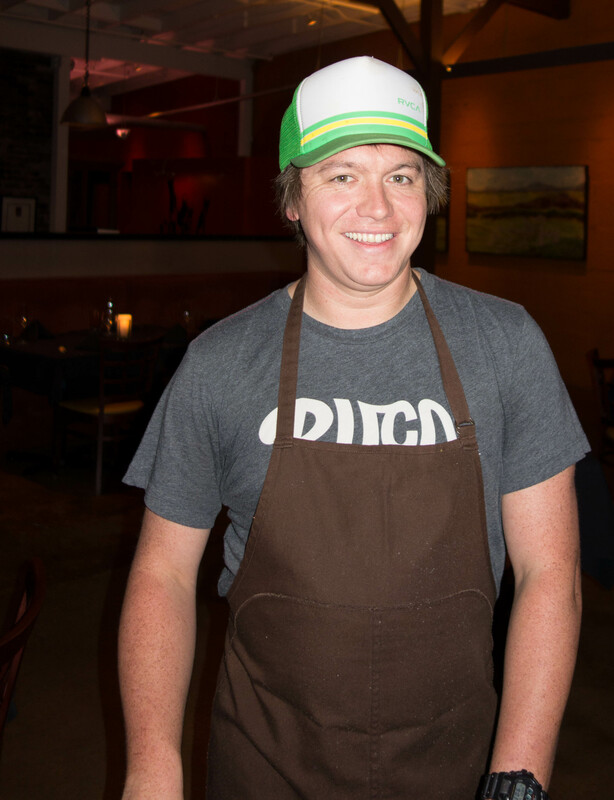 He has also worked in California and Spain–this guy knows his business, and may well not stay in Nashville all that long as he moves up the ladder of big time chefs. Then came dessert. We only ordered 2 of them. 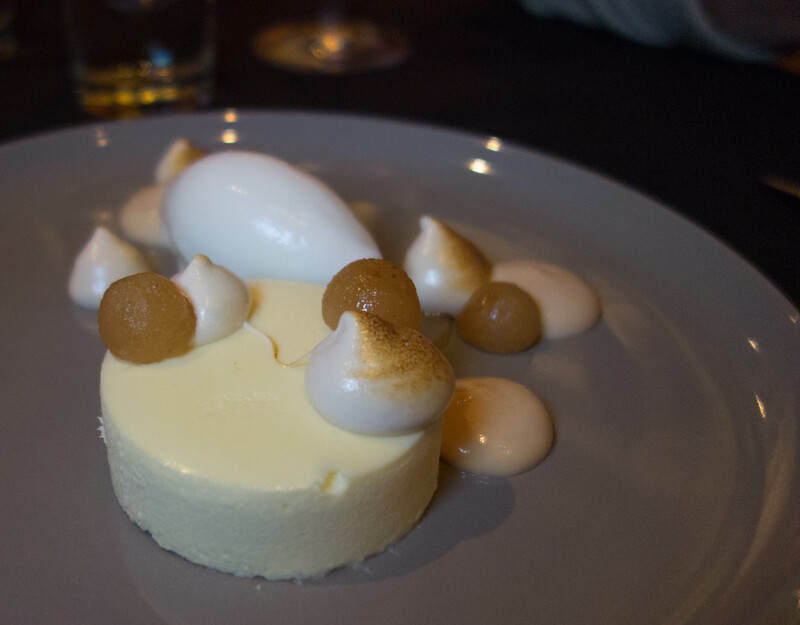 An interesting take on classic cheesecake, we thought the pastry chef (not Matt) spent too much energy on presentation and too little on flavor. Just serving the cheesecake without all the foofrah on the plate would have been better. 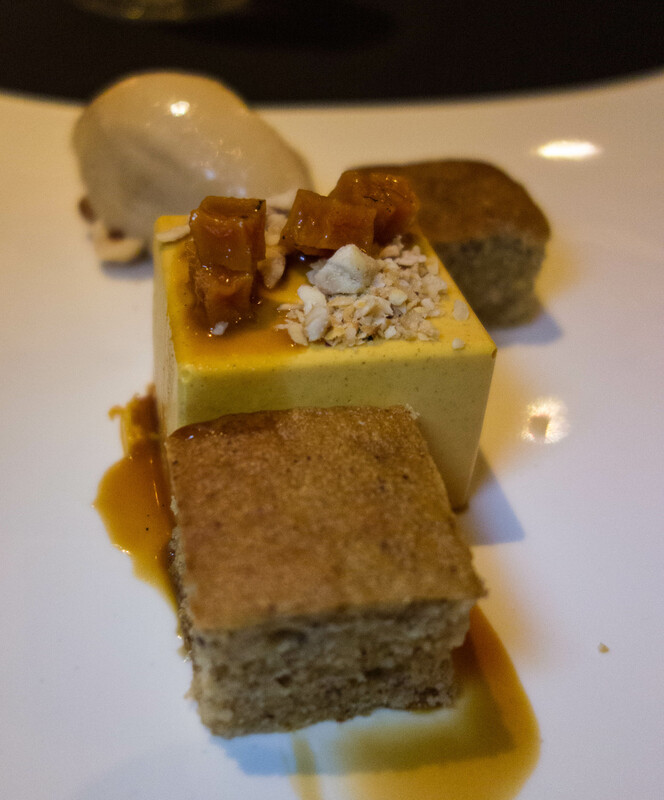 Similarly, the pumpkin custard was over-produced–too much energy into making it a complex presentation, too little strong flavors. Don’t let this sound like we hated dessert; we didn’t. There were no leftovers. We were doing the foodie exercise of being fanatically critical, the better to rave over the perfection of Chantarelle soup. Dinner, with considerable decent wine (I even had a glass of a botrytis Semillon dessert wine from Australia) was about $80/person, not at all unreasonable for this level of cuisine. The service was excellent; considering how little the staff had to do last night I think they were trying to be busy and we got the benefit. To say we like Flyte is an understatement. The food is spectacular and I suspect that Chef Lackey is a rising star. The pastry chef will get better with practice and some guidance from his boss, too. I hope management can improve the marketing to get more people in the door to try this place out. How does one cook game hen in a bag in boiling water and serve it looking so roasty brown? I know mine would look anemic! You throw it under the broiler for a couple of minutes to brown the skin. Especially easy if you have a salamander, but Gail won’t let me install one. The food sounds and looks divine! Hey Chris! I’m Scott Sears, one of the owners and the Wine Director of Flyte. Thanks so much for the visit and this thoughtful and detailed write up. You’ll be pleased to know we are upping our marketing efforts and plan to keep Chef Matt Lackey in Nashville for good. Please let us know when you’ll be back or if you send friends our way. Cheers!